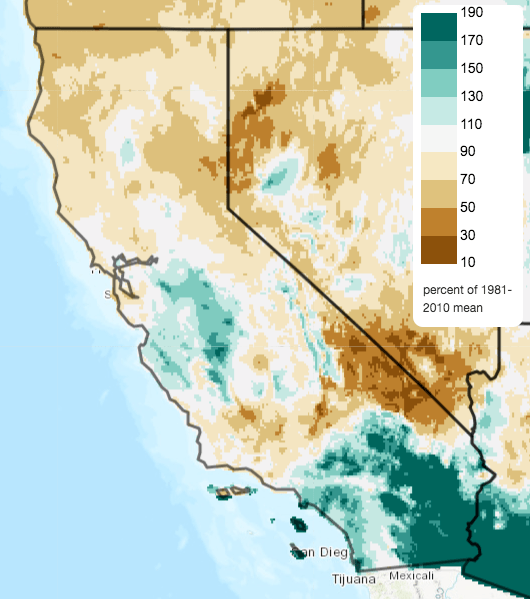 Following a painfully long and dry autumn and California’s deadliest and most destructive wildfire on record, widespread significant rainfall finally arrived in late November and early December. The entire state was running a growing precipitation deficit as of mid-November; after recent rains, the southern third of the state is actually significantly *above* average to date, while the northern third remains slightly drier than average. Much of this SoCal precipitation came over the course of just a few hours on December 6th, when a strong cold front brought intense convective activity to coastal regions. Widespread heavy rain and thunderstorms were reported in the vicinity of numerous recent burn scars, including the Woolsey Fire. While some significant urban flooding was reported in a few places (and some significant burn scar debris flows), there was fortunately nothing even approaching the scale of the devastating Montecito debris flows near the Thomas Fire burn scar this past January. (On a side note, it’s genuinely hard to believe that not even a year has passed since that event. So much has happened with respect to California weather and wildfire in the past year–it’s still a little hard to process). Despite this relatively abundant recent precipitation, conditions across California have remained rather warm. Temperatures have been running well above average from coastal to mountain regions, and that has taken a bite out what might have otherwise been a very impressive snowpack for the time of year. 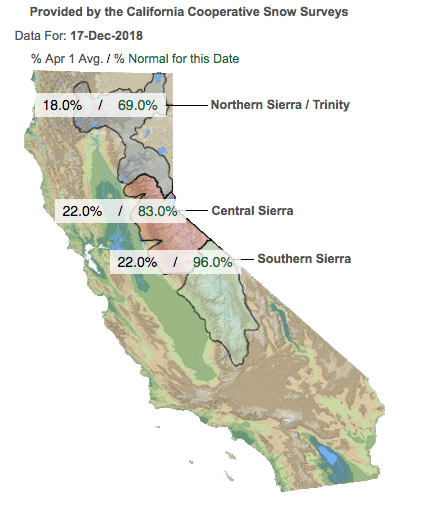 Snow sensors suggest that Sierra Nevada snow water equivalent ranges from near (95-96%) average across the higher Southern Sierra to well below average (65-70%) in the lower elevation north–a latitudinal pattern that we have been seeing regularly in recent years as the climate warms and mean snow line marches up the mountain slopes. But to be clear: by recent standards, these snowpack readings are actually pretty solid–certainly good enough to offer picturesque snowscapes and good skiing opportunities for holiday travelers. After the most recent wave of precipitation across California, conditions are likely to calm down considerably in the coming days. 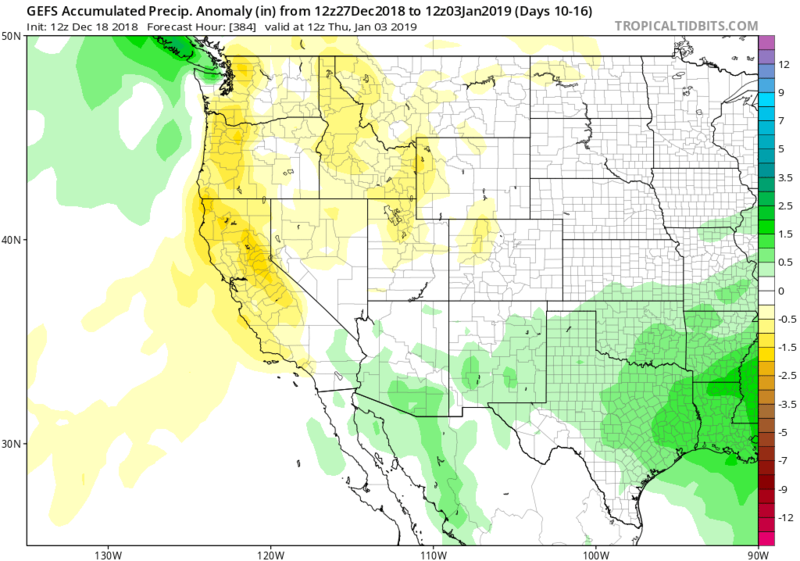 Model ensembles suggest the potential for passing systems and associated light to moderate rainfall in NorCal, with limited opportunities for precipitation across SoCal. A weak subtropical ridge over the far eastern Pacific will deflect the main storm track to the north of California, which will also keep conditions on the relatively warm side for the time of year. There is pretty high confidence that precipitation will be below average across most of California over the next 10-14 days, although there will still be some periodic rain and snow (especially in the north). Fortunately, SoCal is working with a modest precipitation surplus so far this season, so I don’t think the region will fall behind average in the season-to-date totals for a while still. The online weather community has been abuzz regarding the increasing likelihood of a “Stratospheric Polar Vortex Split”–which is, I must admit, at least as complicated as it sounds. (For those interested, I strongly recommend reading this article on what the Polar Vortex is…and (more importantly) is not). Polar vortex splits occasionally occur during Northern Hemisphere winter, and can have dramatic effects on mid-latitude weather as extremely cold polar air spills southward in a few select regions. When this occurs, mid-latitude wave patterns have a tendency to become “stuck in place”–sometimes for weeks or even months at a time! But in California, it’s extremely hard (if not impossible) to say what any particular PV split might mean: the net outcome depends upon the exact wave pattern that ultimately persists, which could range from warm and dry (under a persistent ridge) or cool and wet (under a persistent trough). For now, suffice it to say that there may be an even greater than usual chance for persistent weather patterns starting around mid-January. I’ll revisit this a bit later if and when a PV split actually occurs. What about the Pacific? Where’s El Niño? 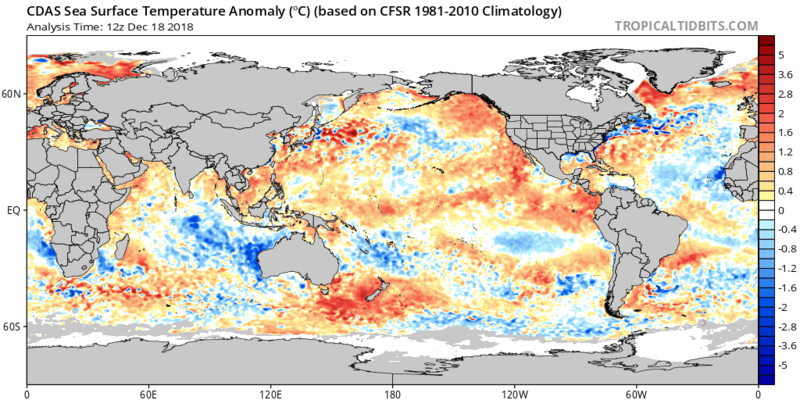 Most of the North Pacific Ocean is anomalously warm at the moment (but what else is new?). Consistent with seasonal model forecasts, the tropical eastern Pacific has warmed considerably above baseline levels, and SSTs in the Nino3.4 region are now in El Niño territory. But as I have tried to emphasize at every possible opportunity, El Niño’s implication for California climate are far more complex than a single index might suggest. This year, for example, nearly the entire tropical Pacific is warmer than average–not just the east. This means that an anomalous east-west gradient has yet to occur, which is one of the most important factors in generating atmospheric “teleconnections” related to California precipitation. Not surprising, then, are atmospheric analyses suggesting that the global atmosphere has not responded to these elevated temperatures in “El Niño-like” fashion. Generally speaking, the present El Niño event is unlikely to be strong enough to exert a major influence on California precipitation this winter, though associated SST patterns may help elevate coastal temperatures a bit above what they would be otherwise. First, welcome! Since I’ve been receiving numerous emails regarding the recent dearth of real-time blog updates, I just thought I’d address it briefly here. As a full time research scientist, there can be periodic time crunches associated with seasonal deadlines and academic conferences that make it difficult to find even a few spare moments to keep tabs on the day-to-day weather (as much as I enjoy doing so!). This is especially true given the recent surge in media interest in California wildfire and climate change-related issues more broadly (a decidedly welcome change, but one that is extremely time-consuming!). When time is at a premium, as it has been lately, I choose to focus on “quality over quantity” when it comes to blog posts–a policy I describe in a bit more detail in the Weather West FAQ. But if the next “ARkStom” is on the way, you can rest assured I’ll find the time for an in-depth post. Also: if you are interested in more frequent micro-updates on California weather/climate/fire issues, you might want to follow me on Twitter.